The film, that’s set in the era of 1949, welcomes the audiences with a track by Raveena Tandon Thadani (special appearance). On the other hand, while a young Balraj (Ranbir Kapoor) is busy taking his baby steps in this man-eat-man world, he also spends his time in the red light district nursing frustrations of seeing his mother getting slapped and abused. Youth throws him in the boxing ring of free-for-all fighting to earn some ready cash. He then comes across Chiman (Satyadeep Misra), who not just becomes his partner in crime, but also his friend for life. As they march ahead in life, they, gradually land up becoming the henchmen for Kaizad Khambata (Karan Johar), editor of the tabloid ‘Torrent’ and also a top wheeler-dealer. Impressed with his dare devil attitude, Kaizad appoints Balraj to manage his club named ‘Bombay Velvet’. In addition to this, Kaizad also entrusts him with the task of wiping out the ‘Communist’s opposition to this ‘Capitalist’ plan. But he meets with a roadblock called Jimmy Mistry (Manish Chaudhury), editor of pro-labour class tabloid ‘Glitz’. It is then, that the beautiful jazz singer Rosie (Anushka Sharma) is sent as a honey trap to lure Balraj by Jimmy. But the duo consummate their passionate romance and become inseparable. The henchman wants to have his share of the pie in the new money-order and that’s when the drama turns bloody and what-happens-after. Meanwhile, Kaizad tries to adopt the policy of divide and rule between Balraj and Chiman. Does Rosie become successful in her role of a honey trap, does Kaizad become successful in separating the Balraj-Chiman duo and what ultimately happens to ‘Bombay Velvet’… is what forms the rest of the story. First things first. 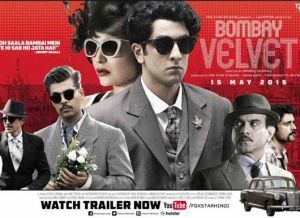 The film’s director Anurag Kashyap needs to be applauded totally for having immense belief in his product named BOMBAY VELVET. Right from the word go, he transports you into an era that makes you believe in whatever you see and hear. Anurag, who has mostly been associated with offbeat cinema, sweeps you off the floor and also your imagination with BOMBAY VELVET. It won’t be wrong to say that he has created the film with a right mix of great performances and eye-catching visuals. Anurag’s impeccable proficiency and flawless mastery over the medium is something that needs to be appreciated. It was a noble intention when Anurag Kashyap wanted to portray the jazz culture of the 1960s through his movie, but that drastically reduces his audiences as far as the Hindi movie going public is concerned. The flip side of the film is that it tends to be way too lengthy in its first half. But the damage control of the first half’s drag takes place in the film’s enticing second half. It is in the second half the film’s pace picks up with dramatic twists and turns, culminating it into a chilling and nail biting climax. The irony of the film is that while its length (148 minutes) plays a spoilsport, there is hardly anything in the film which could have been edited or snipped! In that case, one just cannot place the blame on the film’s editors (Thelma Schoonmaker & Prerna Saigal). Besides the grandeur on which the film has been mounted, there are a handful of scenes in the film which are bound to catch your undivided attention. The introduction (bank) scene of Karan Johar and the sequences which follow it sets the tone and the direction of the movie. In addition to that, Ranbir Kapoor’s fight sequences also form the highlight of the film.